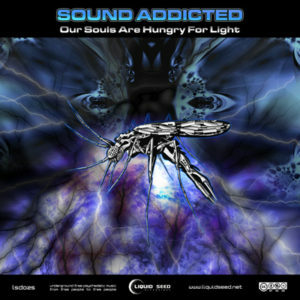 Liquidseed Free Netlabel celebrate their 25th free release with a truly special album, Our Souls Are Hungry For Light, by Sound Addicted (Dionisis Kourakos) from Greece. After releasing his debut, In Between Days, on Space Alchemy Lab he now returns with a full-length album showcasing a wide variety of deep trance, progressive, and downtempo soundscapes. Every song is full of feeling and ritual vibes that will guide you through your inner self and outward into the universe. Mastered by Stathis Tsitsiliagkos AKA Oberon @ Oberon Studio, Corfu, Greece. Artwork concept by Acid Lagos, first sketch by Christoforos Makris, and finally the main artwork and back cover by Angelo Zs. MP3 Download | FLAC Download | WAV Download · Download count: 14,150.
solid release. most were really nice tracks! thanks and blessings to LiquidSeed and Ektoplazm. Tracks 4, 5, 8 are epic. Big Thanks and respect to Liquidseed and Ektoplasm <3 Thanks for the support ! Another Liquid Seed release !! Bravo!!! Veramente delle tracce gajarde..
Hi, can you correct the tagged info for songs no. 3 (Dancing With Spirits), 4 (The Beginning of the End) and 6 (Follow Me) ? The artist tag is set to “Sound Addidted” instead of “Sound Addicted” ! The filenames also are misspelled in the same way for those songs, but more important are the ID3 tags (artist name). Sorry about the spelling mistakes; filenames and tags have been updated and new archives were uploaded.